So many people use Facebook Messenger now that it's probably one of the more common ways to keep in contact with people. It means you don't have to worry about trading numbers, you can contact them for free provided you have internet access and it's a neat little app. However, aside from being able to contact people from your phone on there, you've not had easy access to people on Facebook who you need to message but aren't friends with. Okay, yes, you can message people on Messenger even if you're not friends with them but they don't stay on your list if you're regularly contacting other people. Facebook have realised that this means you might contact people a little less on Messenger if you don't want to be friends with them. 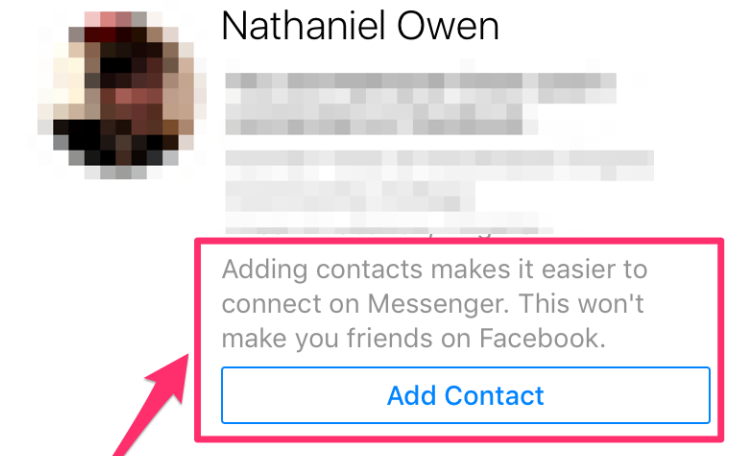 So now they're trying to fix that by introducing an add contact button to Messenger. If you choose to add someone to your Messenger contact list this way they won't become your friend on Facebook, but they will be on your contact list. This means that you can easily keep in contact with them without having to worry about seeing what you're saying or doing on Facebook. This is pretty practical if you have to keep in contact with a business regularly or you're planning something with someone for a project that you don't particularly care about and so on. This is the essentially the sort of network that Facebook are hoping to encourage with this new feature. By now everyone knows that Facebook wants to take over mobile. Changing Messenger to your default text messenger is one step but they really needed to make Messenger stand out as a way to contact people you might not want to have access to your Facebook. Some people are of course pointing out that if you message them on Messenger then they'll know what you're known as on Facebook anyway and can search for you. In a way this is kind of a point, it might be useful if Messenger could allow you to change the name that people see you as on there without changing it on Facebook. Still, if you're taking to someone on Messenger then you know you're taking that risk anyway. Generally, this is a good idea and it will be more practical for a lot of people who use Messenger but it's hard to say whether it will grow Messenger as much as Facebook expects. This feature is still being tested so we don't know how soon they'll be rolling it out.